Happy New Year from the Boneyard Outfitters! This year was one of the best and and toughest years I've ever had. Despite challenging conditions, our hunters put a ton of big bucks on the ground. Check out the PHOTO GALLERY HERE. We had a few missed opportunities at several different monster trophy bucks. However, we had probably 65% or better shot opportunity for archery hunters. Me and Scott tracked a pile of very alive deer...shoulder shots and brisket shots. The good news is that most survived and will still be here this fall. Mom did an excellent job this year as usual - we only tried to kill each other 2 or 3 times, ha ha! She had fresh coffee and hot breakfast in the morning for all the deer hunters. So here is the deal…Anyone looking to come back and hunt needs to book fast because we HAVE the deer and 2015 WILL be our best to date. But gun hunts are almost booked, and were even starting to book gun hunts for 2016. We still have bow hunts open but call me soon to reserve your dates. Thank you to everyone that was a part of our year! Book your Illinois Spring Wild Turkey Hunt with Boneyard - The Deadline with the Illinois Department of Natural Resources for the next drawing is January 12, 2015. Anyone interested in hunting Spring Wild Turkey at Boneyard Outfitters should apply for their permits ASAP! Be sure to call Jason and make sure the season is open before you apply, because you need to select your choice of ONE of FIVE seasons. And be sure to select the SOUTHERN ZONE- FRANKLIN COUNTY! We literally have hundreds of turkeys here just waiting for our Boneyard hunters. We can only hunt until noon, so after you smack down a big gobbler, talk to Jason about catching some crappie on Rend Lake. Call soon, hunts are getting booked. Hunters can apply online for their turkey permit HERE. We just finished checking our trail cams and we are pretty impressed with what we are seeing. We've seen several bachelor groups of buck running around —and one group has 5 bucks in it! They will start breaking up here in a week or two as they seek out their turf for the upcoming rut. All signs point to an early rut this year, which means October should be fantastic with pre-rut activity - bucks checking scrape lines and asserting their dominance over the smaller bucks. This is a great time to use a "young buck" grunt tube to get the big boys fired up. If you are looking to get in on some awesome Illinois bowhunting action, call Jason soon and book a hunt at 618-927-3432. We had one of the best years of whitetail deer hunting ever at the Boneyard, and it’s not over yet. We saw huge numbers of deer throughout the entire season and took a good number of healthy mature bucks. The upcoming herd of deer for next year is going to be incredible. We spotted a lot of 1 1/2 and 2 1/2 year old deer that are all going to be shooters next year. Franklin County was not impacted at all by Blue Tongue Disease (EHD) compared with other counties throughout the state. Our deer numbers were fantastic this year, which means next year they will only get better. October started out a little slow, but our hunters still scored. A lot of does were taken early, and the buck activity really pick up by the end of October. Bucks were working scrape lines before Halloween, and we had a lot of sightings of Booners, with some really good bucks killed. Then November just exploded. Hunters saw monster bucks on many hunts. A good number of bowhunters took some really great bucks every week — check out our photo gallery. The rut started a little bit early this year, so buck activity was consistently good the first three weeks of November. Gun hunters took some dandy bucks and everyone saw giant deer. Then we got to experience something that does not happen too often in Southern Illinois — we got pounded by a winter snowstorm during the second half of gun season. But our hunters toughed it out. A beautiful 150-class buck was taken on the first day, and just about everyone filled their tags. 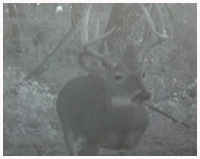 And we still have blackpowder hunters due in camp next week, as well as a few late-season bowhunters. Despite a drastically low harvest across the rest of the state, our deer harvest totals for Franklin County were not much lower than previous years. So our hunting forecast for the 2014 deer season looks outstanding. We already have hunters that rebooked for next year. We hope to see you in camp!